I love this time of year. 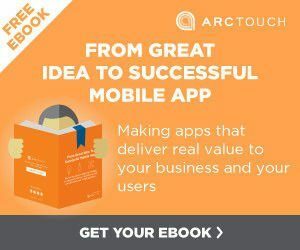 At ArcTouch, we’ve spent the past few months reviewing our own business strategy and how it relates to the changing landscape of mobile and the IoT. We’ve looked back at 2017 and hypothesized about what’s to come in the next 12 months and beyond. And we’re building out our 2018 plans for how to best serve our clients. We’ve learned a lot over the course of this year — from our work building great app experiences, from what we’ve read online, and, most importantly, from our discussions with clients and partners on what they’re facing on the front lines of their business. And, as one of the top app developers in the U.S., we’re happy share our predictions of top trends that will define mobile and the IoT in 2018. It’s been three years since Alexa first showed up in our living rooms. When Amazon launched the first Echo, it seemed like a curious product to many (“So, it’s a speaker I’m supposed to talk to?”). But the sales growth of Amazon’s Alexa-powered product family has been meteoric in the past year. Not to mention that Google Home joined the party, and is soon to be followed by the Apple HomePod. But that’s just the beginning. Amazon is now licensing Alexa (see “Alexa’s Unleashed. And it’s Good News for Skills Developers”), and new devices — including thermostats, home lighting systems, remote controls, automobiles and more — now have the super smart assistant built in. As consumers, we’re becoming increasingly more comfortable and reliant upon using voice to talk with our phones (e.g. Siri and the Google Assistant), cars and smart home accessories. While we’re not about to say that the graphical user interface of the touchscreen is dying, there’s little question that in 2018 voice will become a primary interface to the digital world. And with it, professionals and firms will develop specialized expertise for voice interface design and voice app development, as the VUI coexists with the GUI. Nope. Nor will Windows as an operating system unseat iOS or Android for enterprise mobile users. After all, we as workers are increasingly using our own iPhones and Android phones as part of our companies’ BYOD (bring your own device) practices. But we do believe that 2018 will be a year that sees big growth in applications built by companies for their employees and internal business processes. 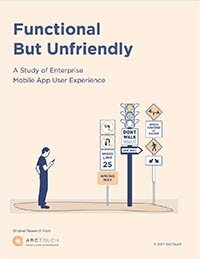 Indicating lots of room for growth, our 2017 enterprise mobile UX research report revealed that only 12% of office workers in the U.S. were using company provided apps for their jobs. One of the reasons we think this will change in 2018 is the maturation of development platforms that make it easier for enterprise development teams to build and deploy multi-platform apps. Specifically, the recently released Microsoft Visual Studio App Center (formerly Mobile Center) — which nicely bundles up all of Microsoft’s mobile tools into one package for enterprise mobile app development teams. A key to this solution is Xamarin, acquired by Microsoft in 2016, which allows Windows developers to write once in C# and publish apps to both iOS and Android at the same time. And with the dominant mobile development platform for enterprises, Microsoft should also see a boost for its Azure cloud services in the battle with Amazon’s AWS for cloud infrastructure supremacy. It’ll be that much easier, now that Microsoft has bundled up all its mobile tools into the App Center, for companies to get everything they need to build, publish, manage and host great applications. Tech gurus have long projected virtual reality as the “next big thing.” But in 2018, we’ll start to see a critical mass develop because of gaming. As is the case with many new types of hardware technology, content is what drives mass adoption. The iPod was complemented perfectly by the iTunes music store. And early versions of smart and connected televisions without the rise of streaming content from Netflix, Hulu, Disney and others, were, to put it kindly, not all that useful. While the hype for virtual reality has seen lots of peaks and valleys, game developers and publishers have been playing the (long) waiting game — stifled by a lack of gamers who owned VR hardware. But Sony, which is a giant when it comes to both gaming hardware and software, reportedly sold a million PlayStation VR units in its first few months on the market last year. And with the continued steady growth of Samsung’s Gear VR, we think game developers will begin to proliferate the app stores with meaningful VR content. And once more compelling VR games exist, we’ll see more gamers buying the best hardware to get the fully immersive VR gaming experience. We also think the soon-to-be-released Ready Player One movie, based on the best-selling book by Ernest Cline, will give VR a boost. The story imagines a not-so-far-fetched virtual world offering escape from a depressing future earth. A big part of the storyline is based on gaming, including references to classic arcade games. There’s nothing like a Steven Spielberg flick about virtual reality to heighten our collective consciousness on the subject. Looking beyond gaming, however, VR isn’t ready for a mass audience just yet. We think the next big driver of adoption could be streaming live sports in VR. There have been some successful pilots of live-sports VR, but the technology stack (and associated broadcasting costs) required to stream entire games in real-time is still a ways away. While the masses will wait, we do expect more companies to explore VR for very specific niche applications that ultimately help people do their jobs. Just one example: Cisco recently built a VR environment that allowed its dispersed workforce to collaborate on projects using a virtual whiteboard. We’ve seen the term “app fatigue” used often to describe the slowing of app downloads in recent years. But we as consumers are not really tired of using apps. In fact, we are spending more time than ever using apps on our phones and other mobile devices. On the surface, these two data points seem to contradict one another — but they don’t. As more experienced app consumers, we value specific applications and don’t waste our time on others. From our discussions with our partners and clients, we believe the market has already adjusted. No longer are businesses building apps simply because they think they should or because they’re trying to keep pace with the competition. Our clients are placing increased scrutiny on the business case for apps before a project begins. Successful mobile projects start by understanding a user need or problem, how an application might solve that problem, and how a business can derive value from solving that problem. In that way, apps are no different than any product that a company chooses to invest in building. Simply put, businesses and developers need to understand the potential ROI of an app before any lines of code are written. (We cover this subject in great detail in our ebook, “From Great Idea to Successful Mobile App”). Related, as members of our industry discuss the success and failure of applications and experiences we create, you’ll hear more about the value of those apps and less about vanity metrics like number of downloads. While VR will see growth in gaming and some other niche applications, augmented reality (AR) will explode in 2018. As we wrote earlier this year, Apple’s ARKit offers developers the ability to easily build augmented reality experiences. But it’s not only that; AR can be experienced on most smartphones. Unlike virtual reality, the market for AR software is enormous because of the millions of phones we carry in our pockets and purses. It’s a ready-made business case for all kinds of brands that want to build a new type of experience for their customers. One indicator: Williams-Sonoma bet big on augmented reality when it recently acquired a development studio specializing in AR. Another: While the hype behind Pokémon Go may have passed, the developer of that game (Niantec) has announced it’s begun work on a Harry Potter AR game. With prominent players investing big and a low barrier to entry, we’re sure to see lots of AR growth next year.